Do you have blemishes? Have your underarms darkened? Do you want to restore a bright, glowing, complexion? Revitabright is a safe, gentle, treatment which may help skin discoloration issues such as these. Revitabright’s Hydroquinone-free formula is gentle enough to be used on even the most intimate areas of your body. Do you have blemishes? Have your underarms darkened? Do you want to restore a bright, glowing, complexion? Revitabright is a safe, gentle, treatment which may help skin discoloration issues such as these. Almost everyone has skin discoloration issues they would like to take care of once and for all. There are as many potential discoloration problems as there are areas on the body. Revitabright’s Hydroquinone-free formula is gentle enough to be used on even the most intimate areas of your body. Clean and dry the discolored area, then apply Revitabright, covering discolored area thoroughly. Be sure that Revitabright dries fully before covering area with clothing. Use Revitabright in the morning and before bed at night. Alpha Arbutin is naturally produced by the bearberry plant, and is also found in pear skins. Arbutin is believed to be an effective natural skin brightener. Lactic acid is said to help skin which has been damaged by the sun. Many believe lactic acid can also help strengthen skin and support collagen production. Kojic acid is a byproduct of the sake-making process, and is found naturally in several species of mushroom. Kojic acid is believed to help fade freckles, age spots, and other blemishes. The full ingredient list includes the following, deionized water, Hydroxyethylcellulose, Phyllanthus Emblica Extract, RevitaBright Blend: Kojic Acid, a-arbutin, Beta-Glucan, Camellia Sinensis (Green Tea) (Leaf) Extract, Daucus Carota Sativa (Carrot) Extract, Saxifraga Sarmentosa Extract, Scutellaria Baicalensis Root Extract, Disodium EDTA, Lactic Acid, Sodium Hydroxide, Malic Acid, Chondrus Crispus (Carrageenan) Powder, Pyruvic Acid, Phenoxyethanol, and ethylhexylglycerin. 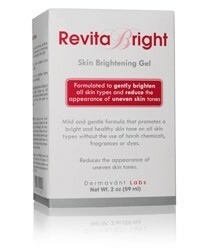 Revitabright may brighten your complexion, and it does the job with a gentle touch. Try it today!